Humans of New York is a project started in 2010 by American photographer Brandon Stanton, who began to document strangers’ life narratives in just a few words accompanied by a photograph. His goal was to introduce the citizens of New York City; however, what he achieved was far greater than he had anticipated. Humans of New York introduces people from not only New York City but from throughout the world, connects them by the experiences they share, and allows for more stories to be told and heard. What began as a simple project on Stanton’s blog has spread rapidly across multiple forms of social media (Facebook, Twitter, and Instagram) and into print where it remained on the New York Times Best Sellers List for 29 weeks. 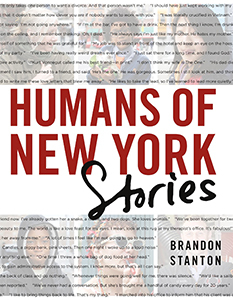 The popularity of HONY can be credited to the evident eagerness to listen to and tell stories. Additionally, the fact that the Internet allows for reception to life narratives to be communicated—instantaneously, and by anyone—has no doubt been valuable in the circulation of these stories. 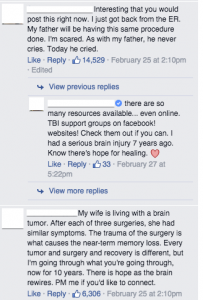 Facebook in particular has enabled the circulation of stories with its “Top Comments” feature, which displays most-liked comments. These comments include not only empathetic and encouraging responses, but responses of people who have their own stories to share. 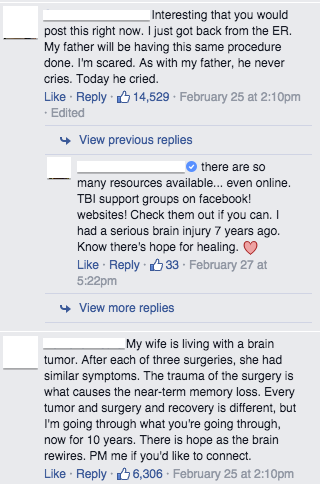 In the example I have provided here and in the screenshot (pictured to the right), the comments section shows some responses to one woman’s story about her father’s experiences with brain cancer. People who have shared in a similar experience, or have been touched by someone who has, are eager to contribute their perspectives. This is the circular movement of life narratives: there is a call for life narratives, and these incite yet more life narratives. Social media as a platform for life narratives is beneficial because it allows people to actively participate in and contribute to the furtherance of discussion. This discussion is crucial because it connects us by providing knowledge and awareness of what others experience.